For the treatment of soft tissue problems, lasers have many advantages. They are minimally invasive tools that generally involve taking away less tissue than conventional methods. Used in gum surgery, for example, lasers can treat gum disease by killing harmful bacteria deep in pockets below the gum line, and removing the diseased tissue without harming the healthy tissue. By removing the disease tissue, they also remove the thin layer of cells that inhibits reattachment of the gum and bone tissues to the tooth, while sealing off the adjacent blood vessels (LANAP). This type of procedure generally results in less bleeding and pain. 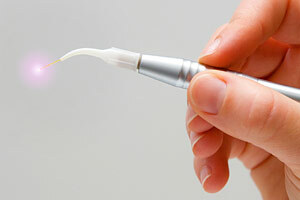 Lasers can also treat disease around a dental implants in a similar way (LAPIP). In addition, lasers are also effective in treating ulcers and sores on the lips or gums.